The kybomancie or cleromancy allows us to discover or foresee the future through launched of dice. It is a very ancient divination technique which is even mentioned in the Holy Bible. At the time we threw bones, stones or shells. 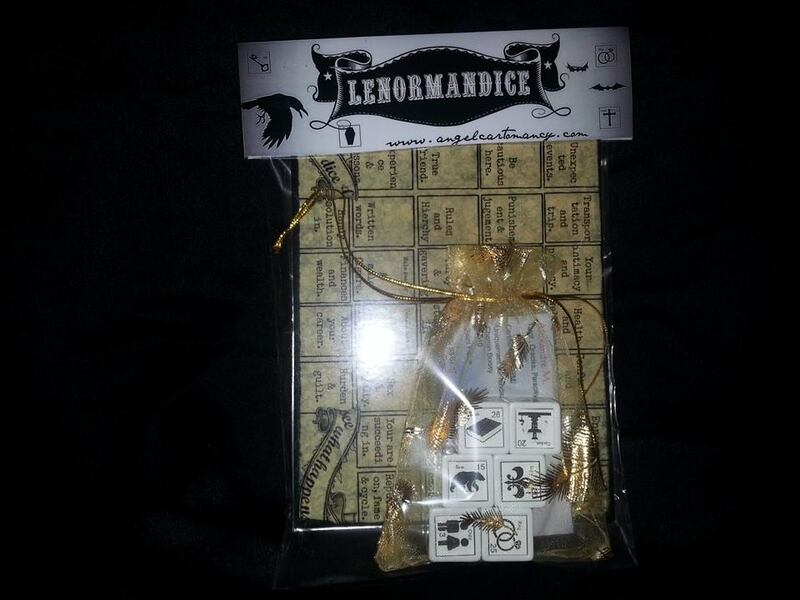 This kit is the amazing marriage of cleromancy and lenormand symbology. When you cast the dice, you have a combination of 6 lenormand symbols that quickly give you insights about what is going on. The casting sheet represents the 36 houses of the lenormand and when a dice lies on a house pair the meaning of the house, to the dice meaning. The First and second batch had been sold out in less than 24 hours making it the most popular divination tool of our shop. Order Yours Today!!! The Lenormandice are also available in a colorful version nestle in an exotic colorful pouch with meaning sheet. This is a limitd edition! Here’s what Rana George, Author of the best selling, The Essential Lenormand: Your Guide to Precise & Practical Fortunetelling says about the Lenormandice. Qual prazo de entrega de envio para o Brasil?